Albert Fry will be honored at a symposium for the Electrochemical Society. Albert Fry, the E.B. 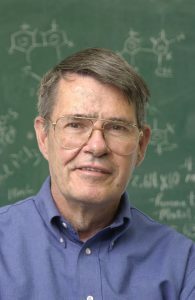 Nye Professor of Chemistry, Emeritus, will be honored at the Electrochemical Society National Meeting in New Orleans in May. The symposium, aptly titled, “The 80th Birthday Trifecta in Organic Electrochemistry,” celebrates Fry, and his two colleagues, Professor Jean Lessard of Sherbrooke University and Professor Denis Peters of Indiana University, who will all be celebrating their 80th birthdays.